The Horizon 2020 NextGenRoadFuels project will convert biogenic urban resources into liquid drop-in fuels for road transport by means of Hydrothermal Liquefaction (HTL). NextGenRoadFuels is a new project funded by Horizon 2020, the EU Framework Programme for Research and Innovation. It will develop a competitive European technology platform for sustainable liquid fuel production technologies, proving the Hydrothermal Liquefaction (HTL) pathway as an efficient route to produce high-volume, cost-competitive drop-in synthetic gasoline and diesel fuels as well as other hydrocarbon compounds. The project supports the SET-Plan Key Action 8 on renewable fuels, contributing to the renewable-energy-in-transport target (with a direct replacement of up to 12% of fossil fuels) and to the GHG emissions reduction objectives (by 75M tons CO2-EQ/year), in line with the Renewable Energy Directives (RED II) and the European Energy Roadmap 2050. Feedstocks for these novel fuels will be low-value, aggregated urban wastes such as sewage sludge, organic waste and construction wood waste, whereas the resulting drop-in road transport fuels will show similar performance to conventional fuels, yet with much lower carbon footprint. Over 100 M tons/y of urban feedstocks may be transformed into 470,000 barrels of diesel and gasoline fuels per day in Europe, at a very competitive selling price thanks to the NextGenRoadFuels methodology. The project will establish a cost-effective valorisation pathway for multiple urban waste streams. It may be conceived either as a stand-alone plant within larger urban centres, with the complete production pathway at a central facility, or in hub-and-spoke arrangements, where a number of HTL plants are served by the same upgrading facility. NextGenRoadFuels addresses concrete needs of Europe’s growing urban communities. Unlike existing waste management solutions, the proposed technology pathway will eliminate all waste-related biological and chemical nuisances and hazards while converting waste to a reusable resource in the form of renewable fuels, fertilizers and proteins thus fostering the urban transition towards a circular economy. Different combinations of thermo-, electro- and biochemical technologies, together with effective management of raw materials, allows the NextGenRoadFuels process to be extremely scalable, as well as more cost-competitive and resource-efficient than current biofuel and renewable fuel technologies. The scalability of the methodology is achieved by the diversification of low-value feedstocks and the possibility of integrating the process into existing supply infrastructures. On the technological side, NextGenRoadFuels will set a better understanding of technological and business opportunities related to the conversion of organic wastes into ready-to-market advanced drop-in fuels. In addition, it will develop a tool for scenario adaptation, guaranteeing further efficient implementation of biofuel production. Further, the project is expected to generate job opportunities with the creation of 50,000 direct and 300,000 indirect jobs across EU Member states through implementation of the HTL technology platform. NextGenRoadFuels consortium at kick-off meeting in Aalborg on the 14th of november 2018. Lasse Rosendahl, Aalboorg University, project coordinator states “The ambition of the NextGenRoadFuels consortium is to establish the HTL technology as a very effective pathway to bring considerable sustainability benefits to the European transport sector, in particular those parts of it for which no good solutions have been proposed so far. The project will demonstrate significant GHG reductions as well as provide opportunities for upcycling and circular reuse of urban waste streams.” Steen B. Iversen, Steeper Energy Aps. adds “The NextGenRoadFuels project will leverage on Steeper Energy’s experience in proving and scaling up its Hydrofaction™ technology for forestry residues conversion in order to rapidly commercialize in the new market of urban waste conversion. Notably, Steeper Energy’s 50 million euro commercial demonstration plant, currently developed in Norway, is of comparable scale to a full commercial Hydrofaction™ plant suited for the conversion of urban wastes”. NextGenRoadFuels – Sustainable Drop-In Transport Fuels from Hydrothermal Liquefaction of Low Value Urban Feedstocks started on the 1st of November 2018 and runs for 48 months. 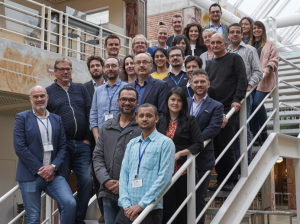 The consortium, coordinated by Aalborg University (DK), counts on 11 beneficiaries from 7 countries: Steeper Energy ApS (DK), Chemical Process and Energy Resources Institute | CERTH (GR), Centro Nacional de Energías Renovables (E), Technical University of Munich (D), Karlsruhe Institute of Technology (D), SINTEF ENERGI (NO), Haldor Topsoe A/S (DK), ENI S.p.A. (IT), Goodfuels (NL), ETA-Florence Renewable Energies (IT). This project has received funding from the European Union’s Horizon 2020 research and innovation programme under grant agreement No 818413.